PennsylvAsia: Chinese woman in Pittsburgh since 1996 fears deportation: "I don’t think I’m one of the priorities they should be looking to deport." Chinese woman in Pittsburgh since 1996 fears deportation: "I don’t think I’m one of the priorities they should be looking to deport." WTAE ran a story yesterday on Fan Ding, a Chinese woman who has lived in Pittsburgh since 1996 but now fears deportation due to the impending repeal of Consideration of Deferred Action for Childhood Arrivals (DACA). Ding came to Pittsburgh at age 12 for medical treatment at UPMC, graduated from Scheneley High School in 2003 and earned an MBA from Duquesne University in 2014. “I was having complications. I had a bone infection. I was literally dying. So the only way for my parents to save me was to try to contact the UPMC doctor here," Ding said. After her story was featured in a newspaper article that caught the attention of then President Bill Clinton, he wrote her a letter of support. 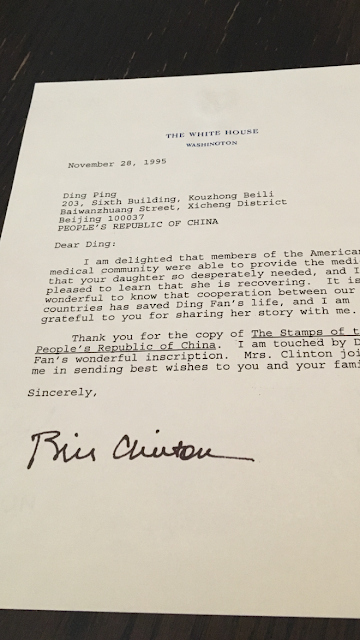 That letter combined with an invitation to Pittsburgh from a doctor at UPMC allowed Ding and her father to obtain B2 visitor visas from the embassy. Fan Ding moved to Pittsburgh in 1996 with her father when she was just 12 years old. She was born in Beijing with a rare genetic disorder called "Gaucher." Her condition required an expensive medicine that wasn't covered by insurance in China. Ding began receiving IV-infusions every two weeks that saved her life. She still dealt with a bone infection that left a serious divot and scar on her leg. Other bone damage forced Ding to receive a hip replacement a few years ago. Despite her medical trials Ding graduated from Schenley High School in 2003, moved on to Penn State University where she graduated in 2006, and then earned an MBA from Duquesne University in 2014. However, Ding said that immigration officials had denied her request to renew her B2 visa when she was 16 years old. So for years she lived in the United States undocumented. The status barred Ding from receiving a work permit or a driver's license. But in 2012 after President Barack Obama's executive order authorizing DACA, Ding applied on day one. “I sent out my application on the first day that they started taking applicants. So it was a new start for me," Ding said. She was granted status as a "dreamer" under DACA and rushed to get her license, a car and a job. She now works in the pharmaceutical industry for CVS and has a condo in Shadyside. But Ding said she woke up worried about her future on Tuesday following the Trump administration's announcement about ending DACA. “At this point, I don’t think I’m one of the priorities they should be looking to deport," Ding said. Nevertheless, it's now possible that her current status could change, should the dreamer program be revoked. “Like President Trump said, he urges congress to take action and as we all know, the DACA is a temporary executive order so it’s not permanent, so maybe the good part of this, could be congress could actually take action and pass a law," Ding said. But Congress was notoriously slow to act after Obama authorized DACA and it's unclear whether a new policy will be enacted prior the announced six-month expiration of the DACA program. "There's both sides to this," said Ding. “I can see people saying that ‘We can’t just give citizenship to all the illegals here.’ I’m not asking to be a citizen overnight, but this is an issue that has to be dealt with. I don’t think it’s realistic to gather up all of us and throw us in a container and through us overseas."